At least watch the first 30 minutes. I’ve seen science corrupted over and over, especially in the diet and health industry. It’s happening with Darwinism, too. This entry was posted in Religion, Science and tagged Darwin, Evolution, intelligent design. I believe I’ve come up with another philosophical weakness within the Darwinian model, this one having to do with adaptive mutation. Let’s take an imaginary creature, a species of reptile for instance. And let’s imagine that somewhere along the evolutionary pathway a mutation occurs in one of these creatures, a mutation that is a precursor to the reptile’s eventual form of a bird. The mutation involves small, stump-like growths on its sides that will eventually turn in to wings. There are several problems here. For natural selection to take root, the mutation must give this particular reptile an advantage over its brethren. But this mutation gives no advantage. Indeed, they seem to be a hindrance. And not only is the mutation a hindrance, it will be a hindrance for thousands and thousands of years, until finally and eventually enough mutations occur to produce wings. It seems that many people who believe in Darwin’s theory look at an advantageous aspect of an animal and forget that in order to reach that point, an animal would have had to endure thousands or millions of years of disadvantage. Now, there are of course certain traits in some animals that we can imagine as being progressively more advantageous. A giraffe’s long neck for instance. With each mutation the neck gets longer and longer and each mutational generation has an advantage over the prior. However, even in the case of the giraffe, there is a problem which heaps yet more mathematical improbability onto the case. In order for Darwinism to be true, a species that experiences a mutation that gives it a slightly longer neck such as the giraffe, must experience the same exact mutation over and over until its neck reaches the length now seen in giraffes. If there is an infinitesimally small chance that the first mutation occurs and is beneficial, how much less the chance that the giraffe experiences a series of mutations that extend its neck? The Darwinist may argue that each generation of giraffes with longer necks has an advantage and therefore outlasts other generations. But why should an advantageous mutation continue to elongate the neck? There is a seemingly infinite number of imaginable mutations that could give giraffes an advantage. The longer neck is not a necessary aspect of survival, since there are other herbivores that don’t have such long necks and still survive. And yet the Darwinist must believe that for some special reason, evolution chooses to give giraffes longer and longer necks, and yet does not choose to give antelopes necks which are close to the length of the giraffe’s. This entry was posted in Uncategorized and tagged Darwinism, Evolution, natural selection. I’ve been rolling this problem around in my head for a number of years. It’s a significant problem I think with the current Allopatric Speciation hypothesis of speciation. That is, how does a species change to another species. Darwin stated this was a major problem with his theory and was honest enough to admit it. The most widely accepted hypothesis is that species become segmented by physical barriers, such as islands, and over time the two separate bodies of the species change independent of one another until they can no longer breed with the other. I offer some problems that I see with this hypothesis in this slide show I created. You can click on the slides to enlarge them. This thought needs to be refined, but this is where it’s at right now. Some Darwinists argue that a segment of a species’ population can become separated from another segment, and that over time, the two segments develop characteristics which correspond with their current environments. This is called Allopatric Speciation. A problem with this hypothesis is that it assumes the passing on of mutations that prevent breeding with the former species occur en masse. Even Darwinists admit that such mutations are extremely rare. So, are we to think that the mutation, which condemns the newly formed species to only breeding with species of the same type, occurred in more than one species representative (creature) at roughly the same time, so as to enable mating? And even if the mutation did occur in a handful of creatures, what is the chance of them actually finding one of the other extremely rare mates on say, an island? But Darwinists, again, say these mutations are exceedingly rare. Suppose a new species spontaneously generates within a proverbial warm pool of water. Of course, the idea of spontaneously generated life is a massive assumption we must make to even begin to argue in favor of the Darwinist view. Life has never been observed to simply “occur” and if we consider that scientists have been able to manipulate chemicals in a laboratory in a way that makes them take on some attributes of life presents an argument for intelligent design not random biogenesis. How am I defining a species? Well, Darwin himself was not quite sure how to define species. 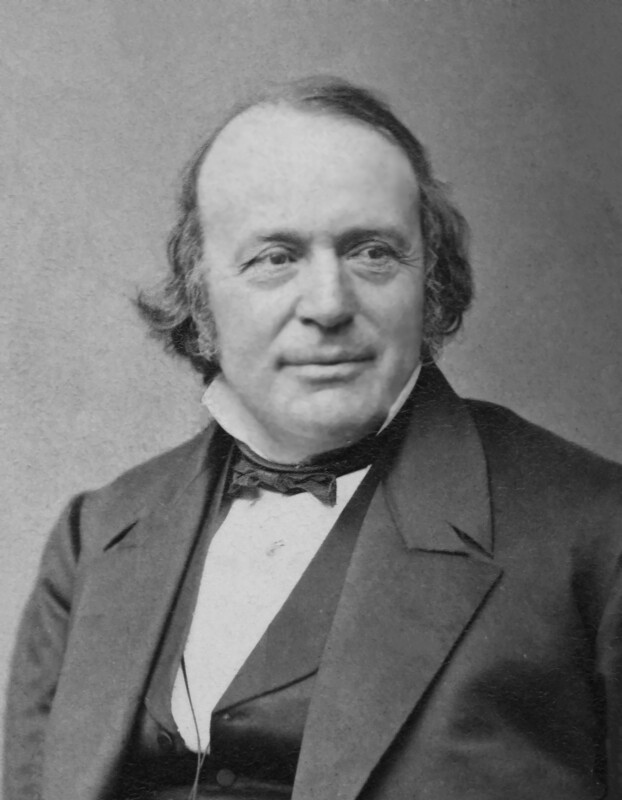 Darwin stated: “I was much struck how entirely vague and arbitrary is the distinction between species and varieties.”  What is the difference between species of lizards and horses? I’m quite simply defining a species as a set of creatures that are able to successfully mate with one another and produce offspring. 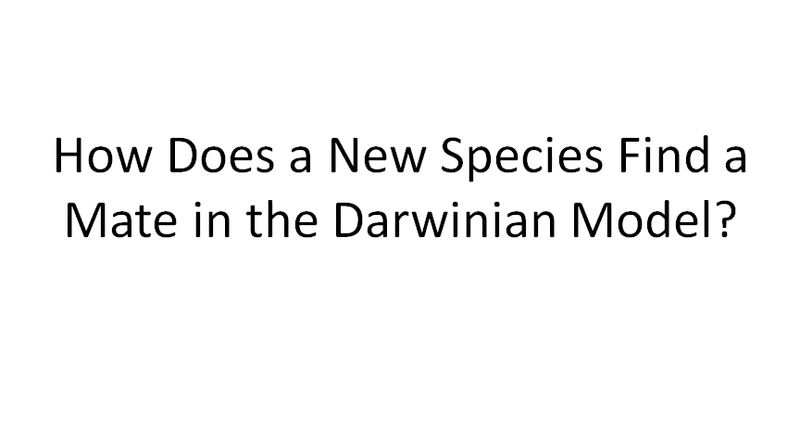 If some want to quibble about this, we’ll have to do it in another venue, but in order to demonstrate the problem of a newly generated creature finding a mate under the Darwinian model, I’m going to define species as thus. Suppose that, in the earliest times of primitive life, a specific habitat—the pool of water—is inhabited by a certain species, Species A. There are several examples of this Species A in the pool, and after a number of mating sequences, another species is produced through mutation. But wait, the Darwinist will say, it doesn’t work that way. The new “species” will merely have changed by something we call mutation. Well, at some point, original life had to make a jump from one species to another. 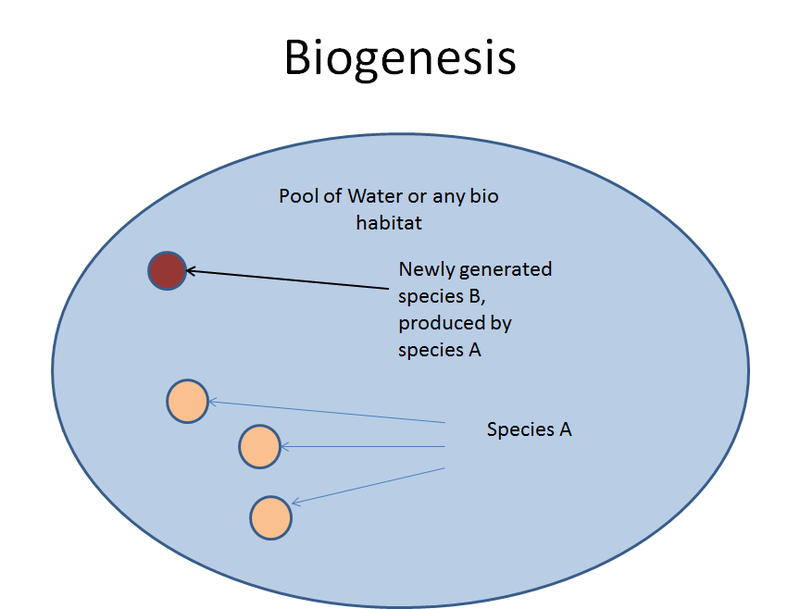 There had to be a point where one species produced another species, and if we adhere to the above definition of a species, that new species (B) will not be able to produce offspring if it mates with the old species (A). We know this had to happen at some point, because there are many, many species that are unable to mate with any other species. Beneficial mutations may occur (hypothetically) within a species, but those mutations do not constitute a change of species, because the creation of offspring is still possible through mating with the old species. Again, we’ll make another huge leap in our assumption that a beneficial mutation can occur, and that a mutation of such a scale as to produce another species can occur at all. Scientist David Berlinski states that no computer model has thus been created that shows evolution occurs as Darwinists say it does. Only with severe intelligent tinkering does something even close happen. And when we consider Borel’s Law—that any event with a probability of occurring of less than 1 to〖 10〗^50 (1 to 10 to the 50th power) will never occur. That number looks like this: 100,000,000,000,000,000,000,000,000,000,000,000,000,000,000,000,000 . The probability, according to Carl Sagan, that a single protein found in the human body could spontaneously generate from the 20 amino acids found in the human body (and over 2 million different protein, comprised of those amino acids), is approximately 1 to 〖10〗^130. (1 to 10 to the 130th power)  But Darwinists want us to believe that this occurs over and over for millions of years—yet we never observe it. 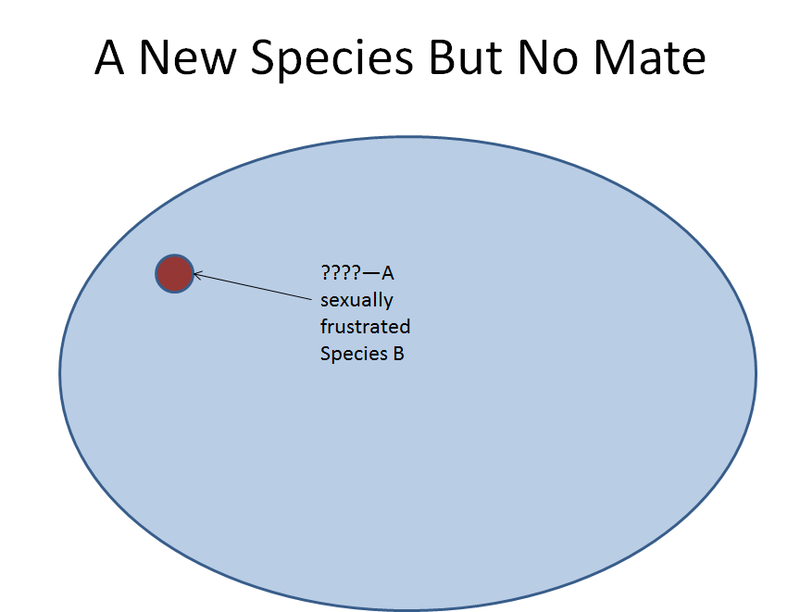 This is important because when a new species is generated, the chances of it finding a mate that has also crossed the reproductive barrier at the exact same genetic “gate” would seem to be even smaller than the mutation occurring in the first place. 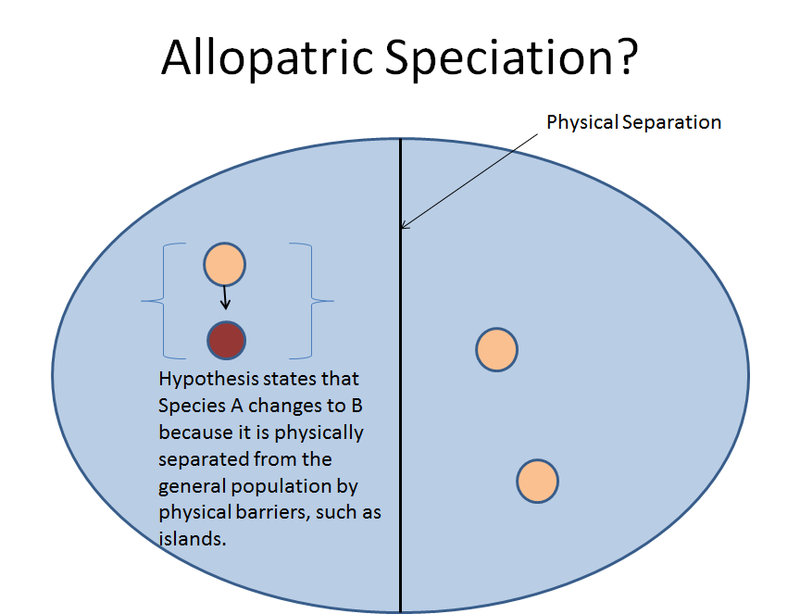 The Hypothesis of Allopatric Speciation is not sufficient to explain speciation. Even when physical barriers are introduced, the separated portion of the species must still, at some point, fall over the cliff which prevents it from breeding with its old species. 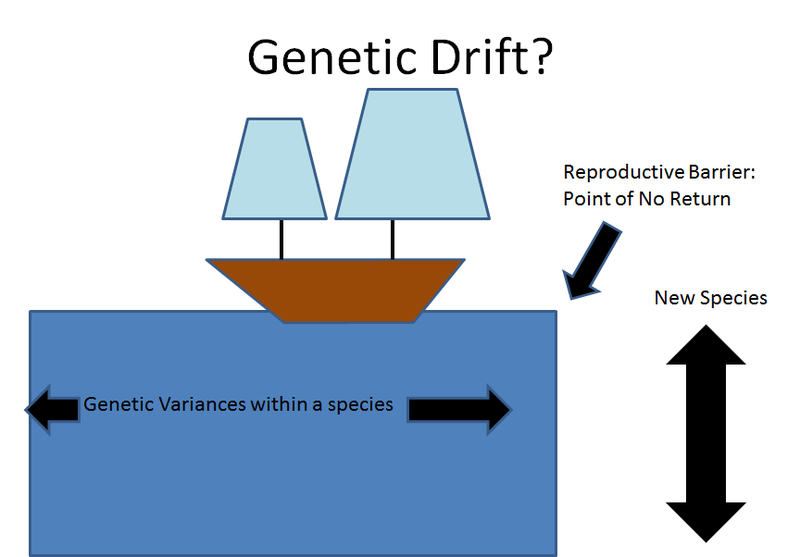 It must occur, mathematically speaking, on an individual level, and cannot occur spontaneously among several creatures.Darwinists want to explain this through Genetic Drift. They say that a species genetic makeup changes over time. And this may be true, however, at some point it is no longer capable of mating with the old breed. At least according to Darwinism. Remember–and this is a very important point–mutations happen to individual plants or animals, not large portions of a population. Summary: Darwinists need to show the mechanism by which a newly generated species which has taken on new traits and crossed over the reproductive barrier find a mate that has crossed over the barrier at the exact same “genetic gate.” The infinitesimally small chances of positive mutations occurring are enormous compared to probability of a mutation, speciation, and the finding of a mate of the exact same (and new) genetic makeup. This entry was posted in Science and tagged creationism, Darwinism, Evolution, Science. Since 99.9% of mutations are harmful to organisms, it would seem that if Darwinism is true, evolution would point species away from the adaptive mutation process, the very mechanism that Darwin claimed made evolution possible. Or perhaps if Darwinism is true, than evolution should decrease the possibility that a mutation is crippling or fatal. Perhaps organisms should constantly be mutating for the better, so fast that we can see it happening. Since Darwinism’s supposedly had millions of years to adapt itself, why not? Maybe it’s just not true. This entry was posted in Science, Uncategorized and tagged Darwinism, Evolution, Mutation, Science.